The All Activity Sonic has a matte black finish, satin chrome pieces, a Z-Spec 2 high-wing spoiler and a built-on roof rack for mountain bikes, wakeboards and other equipment. 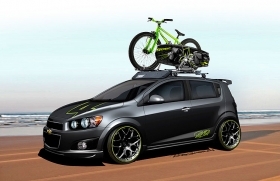 DETROIT -- Chevrolet hopes its tricked-out Ricky Carmichael All Activity Sonic concept makes waves at the Specialty Equipment Market Association show beginning today at the Las Vegas Convention Center. Carmichael, a motocross racer who began four-wheel racing in 2007 and competes in the No. 4 Monster Energy Chevrolet Silverado pickup, gave Chevrolet some ideas for creating a vehicle he could use in his active lifestyle. “He came to us with the design himself and looked at where we were headed with the car and made suggestions,” said Cristi Vazquez, Chevrolet communications manager for the Sonic and Equinox nameplates. The result: the Ricky Carmichael All Activity Sonic concept. The interior seats of the Ricky Carmichael All Activity Sonic were designed by Fox Racing, one of Carmichael’s sponsors, and are made of a material intended to replicate board shorts. Though the vehicle is a concept, Chevrolet officials are aiming for the Z-Spec package, which includes upgrades to the vehicle’s grille, paneling, ground effects, spoiler and wheels, to be available on 2013 models. The Chevrolet Cruze compact also will be on display at SEMA, but Chevrolet plans to stress the possibilities for accessorizing the Sonic subcompact more than the Cruze. SEMA will take place all week in Las Vegas.